After what’s been a very impressive debut season, The Flash seems in danger of fumbling – if not actually dropping – the ball just as it’s reaching its season finale. “Rogue Air” has all the usual crowd-pleasing Flash flourishes (and bad puns, which always cone to the fore when Captain Cold guest stars) but it also feels rushed and perfunctory in places, oddly underwhelming when it should be at its most dynamic. 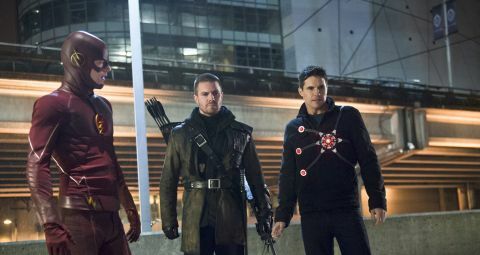 Take the big climactic fight scene between Wells, the Flash, Firestorm and Arrow. It’s a decent enough knockabout, efficiently directed, excitingly choreographed. Mostly, the effects are as polished as ever (though Firestorm isn’t quite as convincingly composited into the action as previously). But… it remains disappointing. There’s a tacked-on feel. Arrow and Firestorm pop up from nowhere just in the nick of time. There’s one line earlier in the episode setting up their entrance, sure, but their arrival still feels like it should be accompanied by an MC bellowing, “Ladies and Gentleman… we give you Arrow and Firestorm!” and a blast of canned applause. Instead of making Barry’s big showdown with Wells feel momentous, somehow their presence cheapens the victory. Not that we’re convinced this is the final showdown with Wells. There’s an episode to go in the season and a particle accelerator still humming. Hopefully the season finale will have a more fitting confrontation. Earlier, the big battle between Team Flash and the escaped metavillains simply looked a mess. The Flash has often given us cinema-worthy spectacle but this was a case where ambition was clearly scuppered by reality. It all looked a bit “small screen” with cut corners and frantic editing doing its best to paper over the cracks. Barry’s spinny arm gimmick made an unwelcome return – it looked just as silly as it did a couple of weeks back and ought to be avoided in future as much as possible. Ferris Airfield was apparently closed after a pilot went missing, which is clearly a reference to Hal Jordan/Green Lantern. It’s a shame, because an episode that features not one but two multiple-metahuman smackdowns should be epic. Instead “Rogue Air” is evidence that perhaps less is more. One brilliant battle is preferable to two slightly dodgy ones. Two big battles also means that the plotting feels a little cursory in places. We’ve already mentioned the convenient appearance of Barry’s super-friends but the central “save the evil-doers” storyline was underdeveloped too. While it’s great that finally the questionable morality the metahuman’s imprisonment was addressed, the matter is dealt with in the broadest of strokes. When Joe says, “I think you all know I’ve never been a fan of this arrangement here,” you have to think, “No we didn’t!” It’s hardly been an issue all season, and the CCPD clearly hasn’t been bothered enough to look into it (we were shown in “Who Is Harrison Wells?” they were happy to let Wells and co take responsibility for dealing with metahumans). Barry’s personal crisis over the kind of hero he needs to be was more convincing but only because Grant Gustin and Jesse L Martin (Joe) have the acting chops to convince us. In pure plot terms, the idea that Barry would turn to Snart for help is horribly contrived. Why not just sedate the meta-villains for the whole journey? Barry now seems to capitulate to Snart so often you have to wonder if there’s a bromance developing. Even with these clunkers, the episode remains an entertaining romp. Cisco – though he drops fewer cultural references than usual – is in great form, verbally sparring with the outrageously flirty Lisa Snart (when she asks him for a code name his first response is, “Female Inmate”). Wentworth Miller has perfected his bizarre delivery of Captain Cold whereby he sounds like he’s reciting Dr Seuss but forgets to make it rhyme. There are loads of fan-pleasing crossover and continuity references. Most surprising of all, though, was that one of the highlights of the episode was the Eddie and Iris storyline. Is Eddie being noble by pushing Iris away? Or just in a massive sulk? Did Wells engineer the split to make sure that his future timeline is maintained? Have we entered a causal loop where Iris only ends up with Barry only because of the knowledge that she’ll end up with Barry? Whatever the emotional undercurrents, their break-up is convincing, well-acted and bittersweet. The fact that Barry has defeated Wells (we’ll assume) in the penultimate episode is an unexpected development and an interesting one. It certainly makes the season finale more unpredictable and exciting to anticipate. Barry has developed this odd leg twitch which for all the world makes it look like he’s having a game of pocket billiards. With so many crossover and continuity references in The Flash, don’t you sometimes wish the show aired with comic-style Ed’s notes? The song playing in the bar when Barry meets Leonard Stark/Captain Cold is “Cold As Ice” by Foreigner (ho, ho, ho). Earlier, in CC Jitters, Barry and Iris are listening to “Every Age” by José Gonzáles. There’s a big ol’ 52 on the side of the truck. So what was on that note when Snart writes down a suggestion that Barry refuses outright? Intriguing? Plus, is that billiard table giving Barry ideas again? This is probably just a happy accident but you can’t help smirking slightly at the phrase “Flash” drive on this show. Lisa Snart’s superpowers are totally reliant on Cisco’s tech. She can also drive a lorry wearing stilettos. When Morden says to Nimbus, “I recognise you,” anybody else thinking, “Yeah, he’s Victor Zsasz in Gotham”? Lucky old Anthony Carrigan has a gig as a villain on both shows. This is the first time Leonard Snart himself actually refers to his growing band of bad guys as rogues. If you don’t know your comics lore then what happens at this point may not be exactly clear. Basically, at some points in comics history, the Flash stored his costume in his ring; it would pop out and he would run into it. When Wells activates the particle accelerator Barry enlists the help of Captain Cold to help move the imprisoned metahumans at STAR Labs to the ARGUS prison facility on Lian Yu.